Once a nonclustered column store index has been defined the parent table or partition can only be used for read-only purposes. Both of these limitations are rumored to be lifted in the next version of the product. Putting these and many other technical limitations aside, purely on the licensing front many businesses simply won’t want to incur the huge cost of the enterprise edition for a feature they expect to see as core for a modern database management system. Granted the current product offers us the best of both worlds, allowing us to combine row based data with column based data but will that be enough of a selling point ? Particularly when many other vendors are offering pure column based storage with high peformance methods (similar to bulk copy/insert) to import data directly into their read/write column stores. One of the many vendors in the column store space is Actian Corporation (formerly Ingres Corp.) (http://www.actian.com/). Their Vectorwise analytic database product is well ranked in the TPC-H Top Ten Performance Results (http://www.tpc.org/tpch/results/tpch_perf_results.asp). 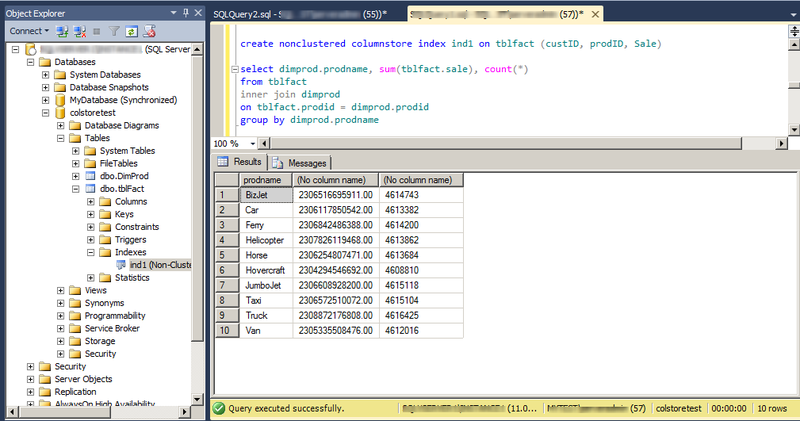 From a SQL Server perspective it’s worth comparing this product’s capabilities with column store in SQL Server 2012. To this end the free 30 day trial Windows 64 bit version was downloaded and installed on a virtual machine configured with 10GB disk space, 8GB RAM and 2 virtual CPUs. The download is available at http://www.actian.com/downloads/vectorwise#trial. One of the prerequisites for one of the graphical administration tools is the Java Run Time environment so this was downloaded and installed as well. 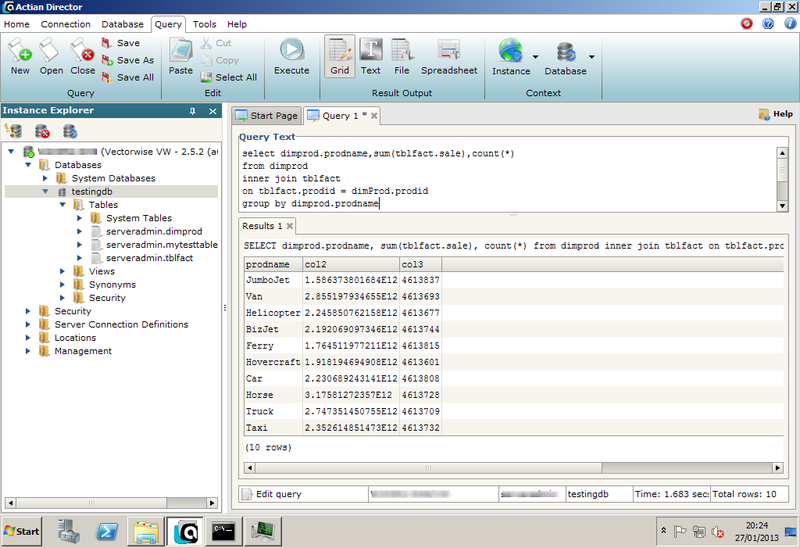 So 46,137,344 rows each of size 16 bytes = 704MB raw data compressed down to 426MB of column store data files. From the file names you can tell which columns have the largest size. Not surprisingly the sale column is the largest and the product column with only a spread of ten products is the smallest. Both JDBC and ODBC can be used to query the database. A very rich and broad range of SQL constructs can be used to query the database including, for example, the windowing analytic functions. The compressed size (using data_compression=page) of this tblfact table was 686MB. The columnstore index on (custid, prodid, sale) was 261MB. Outside the Microsoft world there are many products available that do blazingly fast business analytics with multi-billion row data stored purely as column stores. Many of these products have column store as a core feature and not a costly enterprise feature. With the current limitations of the functionality, with the next release some way off and with other vendors with feature rich products already available it makes sense for businesses to evaluate all options. You are currently browsing the archives for the Column store category.